When preventive dentistry isn’t enough, restorative dentistry is performed to restore the health and function of the teeth and gums. There are times when patients need extensive restoration of old, unattractive fillings and crowns or the restoration or replacement of missing teeth. Dr. Susan Cope, Dr. John Cope and Dr. Lindy Cope each have the knowledge, experience and artistry to transform even the most complex tooth restoration cases into beautiful and healthy smiles. If you would benefit from restorative dentistry, please contact our office to schedule a consultation. We are a Delta Dental provider and also accept other popular dental insurance plans. If the surface of the tooth is damaged, Dr. Cope may recommend a filling. Two main types of filling materials are tooth-colored fillings (“composites”) and silver fillings (“amalgams”). The recommended filling material is based on the size, shape, and condition of the damaged tooth area once the decay (“cavity”) is removed. More extensive tooth damage may require an inlay, onlay or crown. Click for more information on the advantages, disadvantages, and safety of tooth-colored vs amalgam fillings. If you have a tooth that has been weakened by extensive decay, large chips, cracks, or filling, Dr. Cope may recommend a crown, or “cap”. 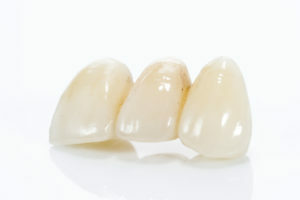 A crown can be created to fit over the natural tooth, or it can attach to an implant. Dr. Cope will recommend the material of the crown based on strength and aesthetic considerations. Our goal is to provide you with a crown that allows you to chew effectively and smile confidently! One of the preferred ways to replace a missing tooth is with a dental implant. 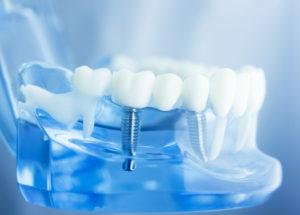 A dental implant is kind of like a small screw in the jawbone that acts as an anchor to support a crown. At Cope Dentistry, we work with several oral surgeons and periodontists who specialize in placing implants. After the implant placement, it takes around 6 months for the bone and gum tissues to heal and grow around the implant until it is strong enough to hold a custom-made crown. The final implant-supported crown functions so much like a natural tooth that many people forget which tooth is the implant! Implants are also placed to help dentures stay in place. If you have a loose denture or are looking to replace missing teeth with implants, ask us if you are a good candidate for dental implants. If you have a missing tooth, a bridge may be an option to fill the space. A bridge is “fixed”, meaning that it is cemented and stays in the mouth (unlike removable partial dentures that are taken out of the mouth). Drs. 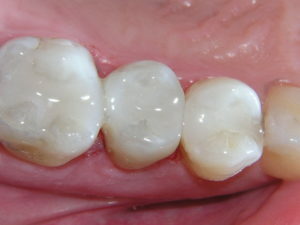 Cope create a bridge by fitting the teeth on either side of the missing tooth space with crowns. A false tooth is permanently-attached to the crowns. Together, the two crowns support the floating false tooth and act as one chewing unit. In addition to helping you chew better, bridges are esthetic, and prevent teeth from tilting or moving into the missing space. If you have any questions about bridges or the pros and cons of the various ways to replace teeth, call/email Cope Dentistry. Dr.’s Cope are happy to answer questions and even have a few sample bridges at the office they could show you in person. A denture is a plate with “false teeth” that covers the gums and replaces natural teeth. A denture should be worn during the day and taken out at night. Getting a denture helps with chewing and speaking. Dentures also support the cheeks and lips for a full, natural smile. At the initial denture appointment, Drs. Cope carefully make a mold of your gums and ask what size, shape, and color you’d like your new teeth to be. 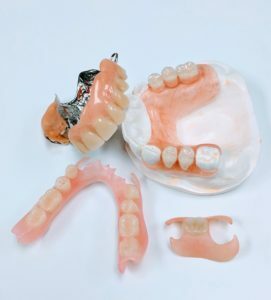 Then, we work closely with the lab to custom-design and build your dentures. Our goal is for you to be satisfied with the fit and look of the dentures, as well as your chewing and speaking abilities so you can quickly get back to your social lifestyle and eating the foods you love. If you have any specific questions about the denture process, immediate dentures, or implant-supported dentures, let us know. A partial is a removable dental appliance to replace missing teeth. 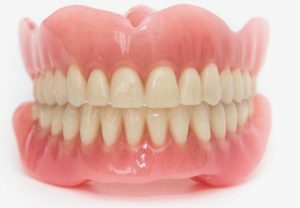 If you are missing several teeth but implants or a bridge are not an option, a removable partial denture may be a good solution. This partial denture is made with clasps that clip onto the remaining teeth. The partial can be worn while eating and throughout the day and then should be removed before bed. There are a few different types of partials made from various materials. A cast-metal framework partial is built from a metal base and clasps. Then, pink acrylic and natural-looking teeth are fused to the base. We also offer a metal-free type of partial made from flexible plastic. We will help you choose which partial is best for you. The American Dental Association, U.S. Centers for Disease Control and Prevention, U.S. Food and Drug Administration and World Health Organization agree that, based on extensive scientific evidence, dental amalgam is a safe and effective cavity-filling material. In addition, Alzheimer’s Association, American Academy of Pediatrics, Autism Society of America and National Multiple Sclerosis Society—all science-based organizations like the ADA—also say that amalgam poses no health risk. Gum (periodontal) disease is caused by bacteria. These bacteria, if left along the gum line, will irritate the gums and cause an inflammation reaction. The gums then begin to bleed and swell allowing the bacteria to go deeper under the gum line. If the inflammation is allowed to continue, the bone will begin to demineralize and dissolve. As the bone dissolves around the teeth, the teeth become unsupported and will fall out. Unfortunately, pain does not occur until the final stages of the disease and treatment at that time has very little chance of being successful. If your gums bleed regularly, seek treatment as soon as possible. Bad breath, or halitosis, is primarily caused by poor oral hygiene, but can also can be caused by retained food particles, gum disease, drainage from sinus dripping or systemic, respiratory or gastrointestinal problems. Proper brushing including brushing the tongue, cheeks, and the roof of the mouth will remove bacteria and food particles. Flossing removes accumulated bacteria, plaque and food that may be trapped between teeth. Mouth rinses are effective in temporary relief of bad breath. If the tooth is a permanent tooth, time is extremely crucial. Immediately stick the tooth back in the socket. Don’t worry about getting it in straight or having it turned backwards, just get it in the socket and immediately call your dentist. If you are uncomfortable placing the tooth in the socket, put it in a glass of milk and get your child to the dentist as quickly as possible. If the tooth is a baby tooth, do not put it in the socket because damage to the permanent tooth can occur. When in doubt, put the tooth in milk and contact us immediately. 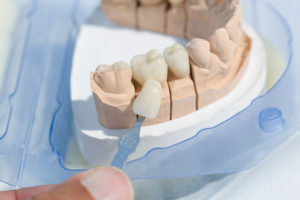 A dental crown is a tooth-shaped “cap” that is placed over a tooth — to cover the tooth to restore its shape and size, strength, and improve its appearance. The crowns, when cemented into place, fully encase the entire visible portion of a tooth that lies at and above the gum line. Crowns are sometimes referred to as caps – they are the same thing.